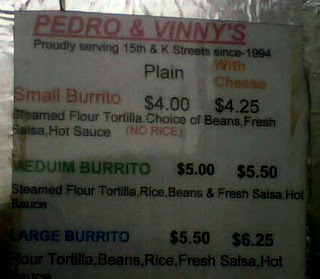 Pedro and Vinny's is a small burrito stand on a street corner in Farragut Square. Kelsey read about it online, and we instantly recognized the stand as we approached 15th and K St. from the 20 person line that stood in front of it. If that many people are willing to wait in this line during their brief lunch hours- then you know this place must be good! John Rider owns this stand, and he opens only during lunch Monday-Friday. The stand is worth going to just for him because he is very sweet and charming! He has dozens of different types of hot sauce, and he makes recommendations based on one's spice and sweet vs. savory preferences. Kelsey and I had the Georgia Peach Hot Sauce because we asked for something on the milder side that was fruity. This sauce made the burrito. Pedro and Vinny's is a vegetarian vegan stand, but don't let this scare you away! He has a plethora of toppings, including homemade guacamole and spicy salsa. You can get the "Black and Tan" which is black beans and pinto beans in one burrito. 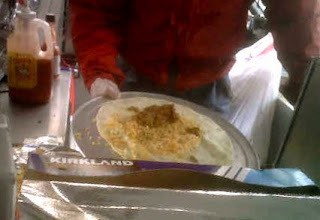 There are different flavors of tortillas, for example tomato or chili, and he piles on the cheese. The burritos are huge, and better yet cheap (4-6 dollars)! You can eat chips and try the hot sauces while you wait in line, and you get a free peppermint patty with your burrito. Now, while nothing can compare to our authentic Mexican food in California, Pedro and Vinny's is a great option for burritos in D.C.